Religious restrictions increased in the Middle East-North Africa region in the year following the Arab Spring, and Egypt was home to some of the most intense government restrictions. But in Egypt, the government’s restrictions also are coupled with a Muslim public that is considerably less tolerant of religious pluralism than Muslims elsewhere. A Pew Research Center analysis released last month found government restrictions on religion in Egypt in 2011 included the use of force against religious groups; failure to prevent religious discrimination; favoritism of Islam over other religions; prohibitions on Muslims converting from Islam to other religions; stigmatization of some religious groups as dangerous sects or cults; and restrictions on religious literature or broadcasting. Not only were each of these government restrictions present in Egypt, but the intensity of each of these restrictions was higher than in other countries. 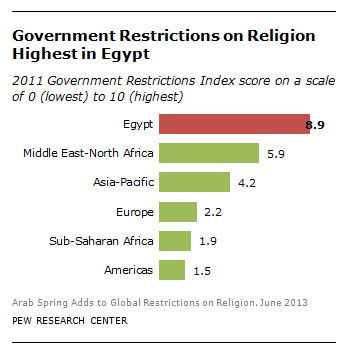 Those actions earn Egypt an overall score of 8.9 out of 10 on the 2011 Government Restrictions Index — a scale developed by Pew Research to gauge government restrictions on religion in nearly 200 countries and territories over time. That’s much higher than Middle Eastern-North African countries as a whole, where the median index score (including Egypt’s) is 5.9. Public opinion polling conducted in Egypt during a similar time frame (November-December 2011) shows that many Egyptian Muslims recognize the lack of religious freedom in their society. When asked whether they are very free, somewhat free, not too free or not at all free to practice their religion, fewer than half of Egyptian Muslims (46%) answer “very free.” Fewer still think non-Muslims in Egypt are very free to practice their faith (31%). By contrast, a median of 78% of Muslims across the 39 countries polled in Europe, Middle East, Africa and Asia, say they are very free to practice their religion, and 73% say non-Muslims in their country are free to practice their faith. Overall, about one-in-five Muslims in Egypt (18%) describe non-Muslims as not too free or not at all free to practice their religion. However, Egyptian Muslims are not necessarily troubled by this perceived lack of religious freedom: Two-thirds of those who say non-Muslims in Egypt are not too free or not all free to practice their faith say this is a good thing. Like many Muslim publics surveyed around the world, a majority of Egyptian Muslims (74%) want sharia, or Islamic law, enshrined as the official law of the land. However, Egypt is one of the few countries where a clear majority (74%) of sharia supporters say both Muslims and non-Muslims in their country should be subject to Islamic law. Worldwide, a median of 39% of Muslims who favor enshrining Islamic law say sharia should apply to Muslims and non-Muslims alike. Egyptian Muslims also back criminalizing apostasy, or leaving Islam for another religion. An overwhelming majority of Egyptian Muslims (88%), say converting away from Islam should be punishable by death. Among the 37 countries where the question was asked, a median of 28% of Muslims say apostates should be subject to the death penalty. Brian J. Grim is a Senior Researcher at the Pew Research Center’s Religion & Public Life Project.